You are here: Home / One Room Challenge / One Room Challenge Week 1 :: The Plans! One Room Challenge Week 1 :: The Plans! 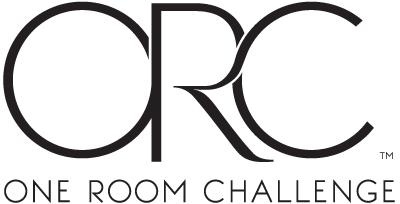 It’s the first week of the One Room Challenge and I can’t wait to share all my plans with you guys! If you’re new around here – welcome! We have a bit of a unique living situation that you can read more about on my FAQ page. This is my third ORC that I’ve participated in and am so excited to be a featured designer this time around. My first time we tackled our laundry room and the second time we renovated our master bathroom. We recently replaced all the flooring on our main level which has led to a big blank slate in a few rooms in our house, so I had some options when deciding what room to makeover. 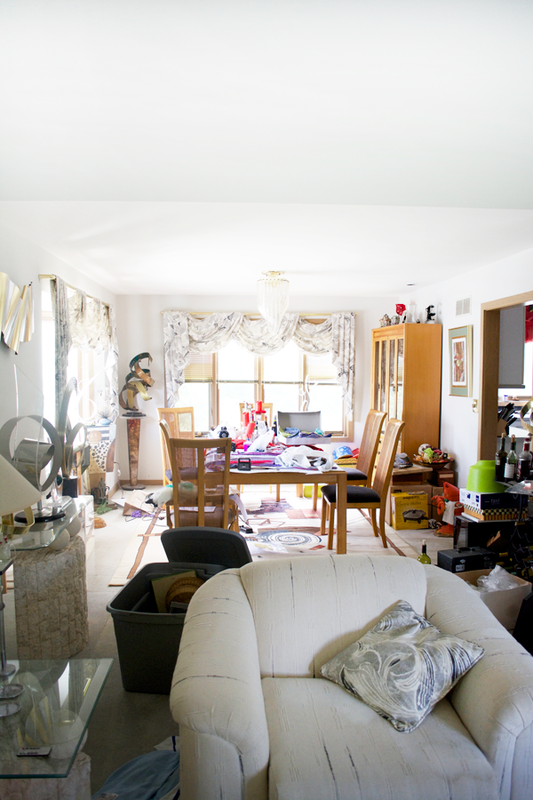 But I ended up choosing…our open concept living/dining room! 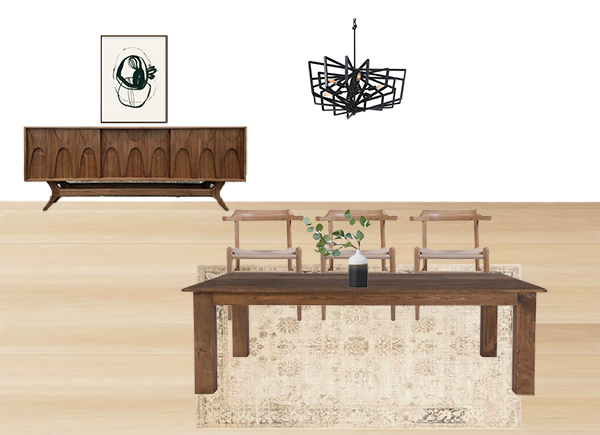 I was initially just going to do our new family room but the space really is one large room connected to our dining room as well so I figured I might as well make this even more of a challenge and do it all! I’m probably going to regret this decision – it’s hard enough to do one room in 6 weeks let alone 2! eek. But I’m excited to tackle these spaces and have some beautiful new rooms to hang out in just in time for the holidays. So let’s first take a little walk down memory lane and show you what this space looked like when we first moved in just over two years ago. 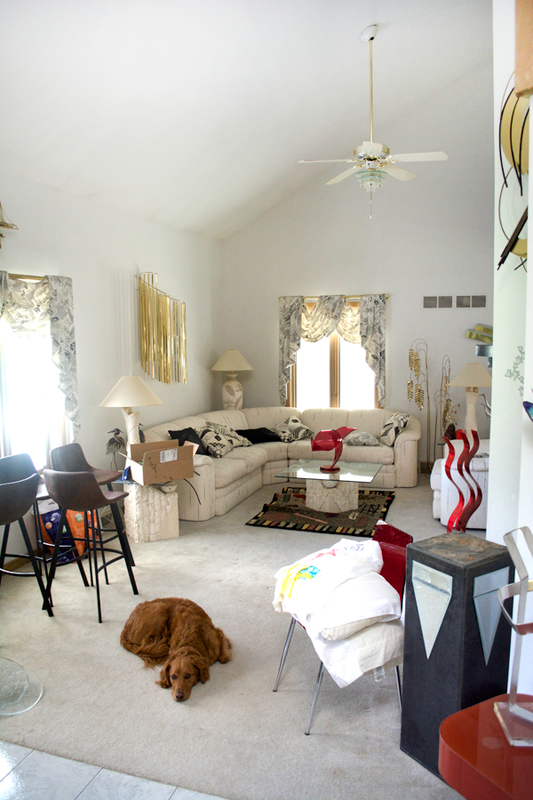 This was the formal living room that we’re now going to turn into our more casual family room. 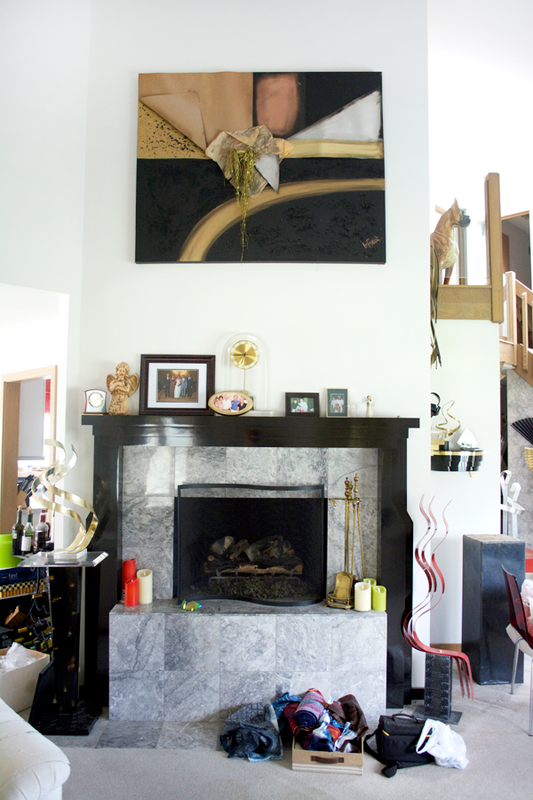 This fireplace will be getting a major makeover that will be starting this week! This room was the formal dining room, but since we don’t have a kitchen table or eating area (besides stools at our island) I’ll be turning this into a more casual dining/eating space. As I mentioned, we recently replaced all of the flooring on this main level, so things look a little different today. But they pretty much looked like that until about 2 weeks ago ha. I’ve been living with all of that for so long now I cannot WAIT to make it feel like the rest of our house. Here’s a peek at our new wood look tile floors that I am absolutely in love with! I can’t believe how much different the space is already looking. I’ll be sharing some more detailed posts about our flooring soon, but you can check out my first post on Why We Chose Wood Look Tile for our Main Level. Ok now on to the fun part – my plans! 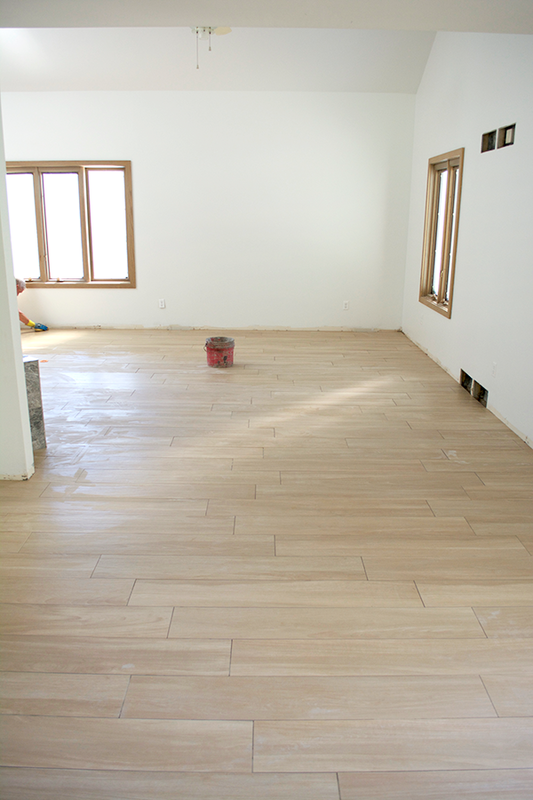 For the family room side of the space, we’ll be doing the fireplace in a gorgeous concrete looking tile from Marazzi. I was torn between going dark or light but ultimately decided to make it a show stopper and go dark. We’re also working with a local lumber company to help us build an entertainment center. I fell in love with this one from Arhaus but couldn’t stomach the price so DIY it is! It will be a little different from the one shown below, but will be the same concept. My girl Denise from Eclectic Goods is hooking me up with some insanely gorgeous goodies like those accent chairs and coffee table. I’m beyond excited for those pieces to arrive. And that delicious leather couch from Article – ah! So good. It arrived last week already and we’re in love. I also can’t wait to hang up that beautiful chandelier from Lamps Plus. I’m usually not a huge fan of chandeliers like that, but I love the modern vibe it has. 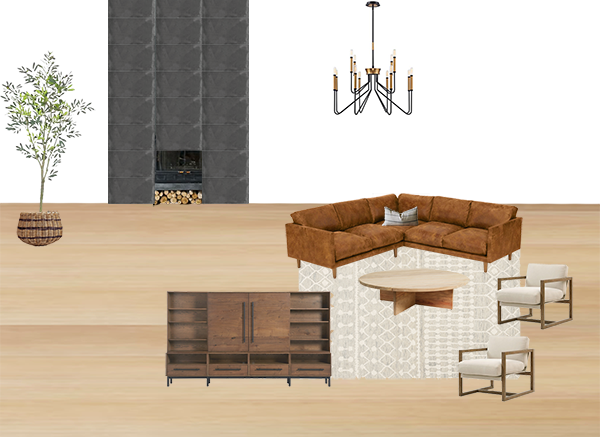 I’m sticking to a very neutral and earthy color palette with all my furniture and decor and am loving this vibe so far. For the dining room side of the space – I’m on the hunt for a vintage credenza similar to the one I used in our bathroom but a bit longer. Our table is one that has been in Dan’s family for a while that I decided to keep and redo. I sanded it all down and am working on adding a new wood pattern on the top where there were previously mirrors. It was bad. That gorgeous light is the Gymnast from Varaluz and you can adjust it in all different ways to change up the look. We’re also adding some Pre-Painted Shiplap to the ceiling from Metrie. SO excited about that. I’m still figuring the chairs out but leaning towards something similar to these ones below. So in terms of big DIY projects we have the entertainment center, the fireplace, the table, the shiplap ceiling and a little built in bench by some windows in the dining room. And maybe a wine rack. No big deal right? Totally doable in 6 weeks. ha. It’s go time! Make sure you’re following along on instagram to see all the behind the scenes action! 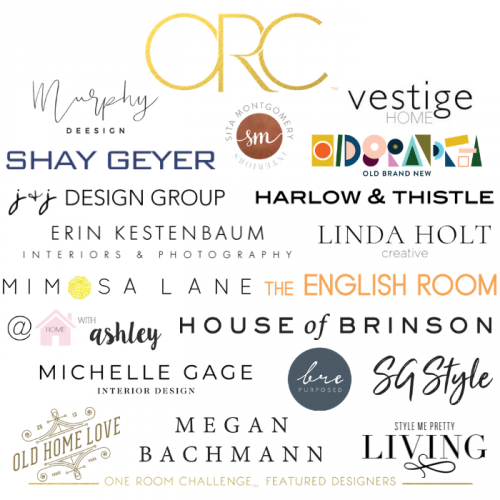 And make sure you follow along with all the other featured designers below! None of this would be possible without my amazing sponsors! This is going be an awesomeee transformation and I can’t wait to see it!!! Don’t waste time by finding contractors and supplies for your home. Hire the best ones to avoid more problems. Wow! That new flooring looks so good! You’re tackling a ton! I can’t wait to see how you do it! 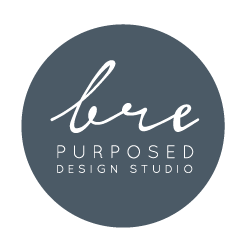 Congrats on being a featured designer! Thank you so much Jess!! What a unique and wonderful living situation you have! I’m sure your father in law loves having you all there. And, your plans for these spaces are just beautiful. Looking forward to seeing them transform! He absolutely does! It’s a win win for all of us! This is a really ambitious plan. When will you sleep? Looks fantastic, and the tile floors are gorgeous. This is going to be a big transformation! I love the floors and all your choices. Excited to follow along on this one! This is going to be AMAZING! 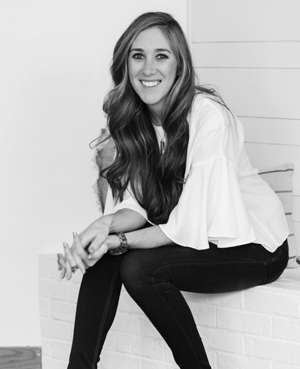 Congrats on being a featured designer – you absolutely deserve it!! Aw thank you so much Sarah!! Thanks Christine! Fingers crossed we can get it all done! Can’t wait to see you transform this space – I’m loving all the earthy, yet clean and modern design plans! This is going to be stunning! I’m obsessed with your sofa choice! Thanks Ashley! It’s a dream! I cannot wait to see the transformation. This will be an exciting 6 weeks for us all! May the force be with you. That is a lot of work in a short time!! Excited to follow your progress!! Good luck and congratulations on being a featured designer this round! ha thanks Stacy!! Hopefully we can pull it off! I love your plan!! This is going to be amazing! I especially love that floor and look forward to reading more about it. I love your lighting choices!! Thank you so much Albertina!! These plans looks great! I can’t wait to see how it turns out! I was lead to you via your master bathroom makeover! I’m obsessed with it and it has made its way on to many of my own mood boards. Aw I’m so happy to hear that! Thank you! wow! Loving the new design! I cant wait to see it all come together. I love your choices and the hardwood floors! It’s going to look amazing! Thank you so much Denise!! Yay! Can’t wait to see your space!